We tend to go through cycles of what we want to eat. It starts with the let’s eat light and healthy segment followed by the let’s have a nice big dinner spurt and then comes the we need a lip-smackingly decadent dessert after our big dinner stretch which leads us back to the beginning. Right now, it seems we’re back at the beginning, for a few days anyway, and this soup fit perfectly into that part of the cycle. 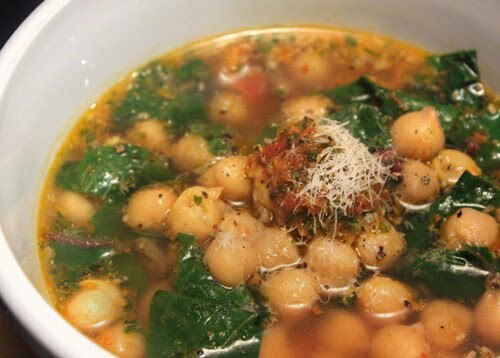 This chickpea and swiss chard soup was in the April issue of Food and Wine. Not only was it a healthy meal, there’s a great tip in this recipe for adding rich flavor to a broth in a very simple way. A piece of parmigiano rind was added to simmering broth. That’s a well-known trick, and I save rinds for this purpose even though I usually forget to use them. After just a few minutes, a so-so broth is transformed. This recipe didn’t stop there either. Before serving, sun-dried tomato pesto was stirred into the soup. Not only was this a light and flavorful dish, it was also very quick to prepare. It would have been one of those record-time dinner preparations, but I decided to make homemade pesto instead of buying a jar of it. I followed the sun-dried tomato pesto recipe from Vegetarian Classics which included flat-leaf parsley along with basil leaves, pine nuts, garlic, olive oil, parmesan, and sun-dried tomatoes which were soaked in boiling water before being drained and added to everything else in the food processor. The soup was started by simmering some broth with the cheese rind and chickpeas. The rind was discarded, and then chopped swiss chard was added and cooked for just a few minutes. The soup was removed from the heat, and some pesto was stirred into it. That was it. Each bowl was garnished with a little bit of pesto and some grated parmesan. This recipe is a keeper for how quick and full-flavored it was. Chickpeas and swiss chard are always a great match, but the pesto perked them up and gave the soup a tangy freshness. Meals like this make our eating light and healthy kick last a little longer, but soon enough I’ll be deciding what to make for a tempting, rich dessert. What a great combo! would be delicious with some croutons. Chickpeas are some of my favorite canned goods. Other than using them pureed to thicken soup, we always roast them or make hummus. There are so many ways to incorporate chickpeas into foods. Oh man, we think alike. This is on my to make list for a while. Love how it looks. great photos! A wonderful combo! Light and tasty! we made this soup too. it was great with that cheese background. great picts too. I would love to have a bowl of this. Yummy!! Perfect on a chilly night. I'll have to save my parmigiano rind. What a great idea. That must bring so much flavors to the soup. Oh yum = this is heaven to be sure! I bet the chickpeas are very creamy in this soup.. Delicious and healthy soup. Perfect for chilly night! How wonderful, I just love chickpeas! Hope you have a fantastic weekend. I love everything about this soup! Wonderful flavours and I bet the chickpeas add a nice texture. This looks like a winner. I have some greens to use up so I think I will bring it into rotation asap. I truly wish I could have a bowl of this soup as I look over the light layer of snow covering our backyard! I have a slight intolerance to chickpeas (similar to peanut reaction) - can you suggest another bean/legume that would make a nice substitute? i just cannot get into chick peas. i wish i could, i know they're healthy! but the rest of this - especially the broth - sounds amazing!! i would love this soup sans sun-dried tomato pesto, but by tossing that wee little component into the mix, you've made this utterly irresistible. stellar, stellar soup! That looks fabulous! 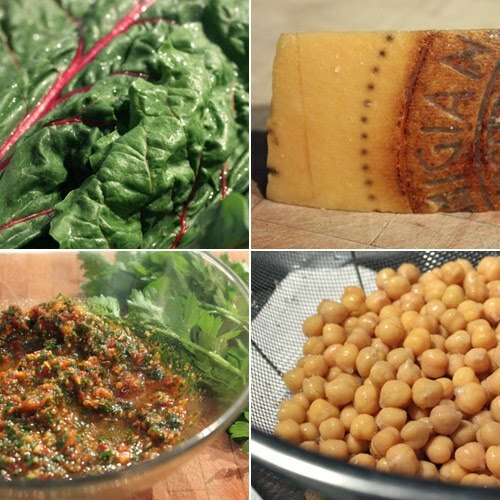 Love chickpeas and chard. I don't know why I always forget to pick up chickpeas! I would make this soup today if I didn't have to run to the store. I love the idea of the pesto blended into the broth. The fact that this is quick makes it even more appealing! Do you think you could use fresh spinach instead of the swiss chard? TN: White beans would be a great substitute. LS: Spinach would work fine here, but I would just add it with the pesto rather than letting it cook for four minutes (which the chard did) since spinach is more delicate. I saw this recipe in F&W and marked it as a "to do soon"
But seeing how your soup turned out, I am definitely moving this recipe up! MMMMMMMMM,...I love healthy & so tasty soups as this one!! 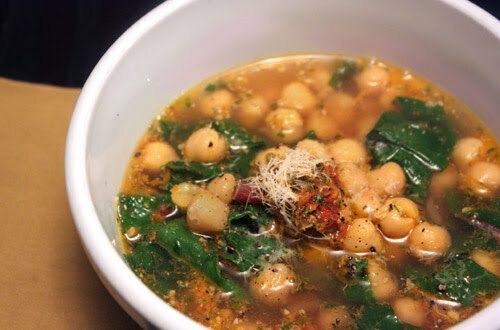 I also did sort of this soup a while ago/ I had Swiss chard, red lentils & chickpeas in it! I don't mind healthy when it looks as good as this! The pesto sounds like a delicious addition and I love chickpeas! The soup sounds excellent with swiss chard and chickpeas in it! It looks so comforting. I love chickpeas in soup, they are definitely filling. And swiss chard is a perfect addition in this soup. YUM! Thanks, Lisa. I'm going to make this soup soon! I love me a chickpea soup...good, filling, delish and cheap! Everything is nice about this soup. I have to say that we eat chick pea in some form or the other atleast 5 days a week. what a fulfilling soup. I'm currently on a chick pea kick after my few days of eating in NYC. I also have a stockpile of greens in my fridge from my CSA. I'm glad to have another delicious recipe in which to use them. I don't like chard, but now I've got some inspiration for what I could do with the kale that's wilting in my fridge. I love soups like this in the cold months, and I too save my parmesan rinds for the purpose! I love how classic and simple this is, but with a twist with the sun-dried tomatoes. It's the perfect bowl-food on a chilly evening.